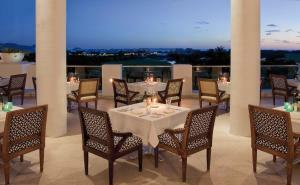 Cuisinart Golf Resort and Spa offers an 18-hole golf course, an outdoor pool, a spa and a hydroponic farm. The air-conditioned suites feature terraces with spectacular sea or pool views. Each stylish suite features a seating area with cable TV and a Bose music system. All accommodation has free Wi-Fi and also a private bathroom. CuisinArt offers a range of international dining options, including Japanese, Italian and the acclaimed Le Bistro at Santorini, featuring farm to table menus. The resort’s Venus Spa features 16 treatment rooms, a gym, and provides fitness classes, water sports and other activities. You can also book tours and excursions at the Concierge Desk. 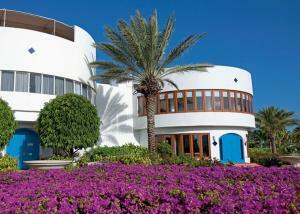 Blowing Point and Ferry Terminal is just a 7-minute drive from the CuisinArt Resort. Anguilla Clayton J. Lloyd Airport is a 10-minute drive away.